Author(s): Sharon Einav, Surgical Intensive Care Unit, Shaare Zedek Medical Centre affiliated with the Hebrew University, POB 3235, Jerusalem 91031, Israel. Joseph Varon. Heart failure is a leading cause of long-term maternal morbidity and mortality in developed countries. The most common cause of maternal heart failure is cardiomyopathy. Peripartum Cardiomyopathy (PPCM) is a distinct idiopathic disease that is not triggered by the hemodynamic changes and myocardial overload associated with pregnancy. 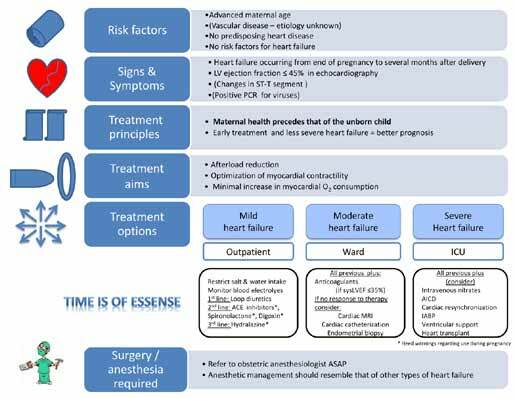 Diagnostic criteria include the development of heart failure in the time frame between the last months of pregnancy and the months following delivery, the absence of prior heart disease or other identifiable causes of heart failure and an echocardiography demonstrating LV ejection fraction<45% and/or fractional shortening. Diagnosis requires a high level of suspicion; signs of heart failure may be masked by the pregnancy itself and/or by associated diseases such as hypertension and preeclampsia. The hallmark of the disease is the typical reduction in LV function. The incidence of PPCM ranges between 1:100 to 1:3000 live births, and is particularly high among women of African descent. It remains unclear whether race is a modifier of the disease or a risk factor unto itself. Plausable causes for the disease include: exacerbation of pregnancyinduced myocardial injury caused by certain virus strains, genetic and/or environmental factors, circulating autoantibodies, and a flaw in the normal cardioprotective mechanisms of pregnancy allowing development of a vasculopathy triggered by abnormal peripartum hormonal changes. Treatment is comprised of standard heart failure therapy (restriction of salt and water intake, diuretics, angiotensinconverting enzyme (ACE) inhibitors, mineralocorticoid receptor antagonists, beta blockers and digoxin) and preventive anticoagulation if the ejection fraction ≤35%. Delivery should be planned and carried out by a multidiscipliniary team. Maternal health should always take precedence over fetal health. Failed therapy should prompt further workup (magnetic resonance imaging (MRI) of the heart and/or cardiac catheterization and endomyocardial biopsy) and consideration of less conventional treatment modalities (e.g. immune modulation, bromocriptine), resynchronization, mechanical support and even heart transplant. The prognosis of PPCM is associated with the severity of heart failure at presentation and the response to therapy and is generally better than that of other cardiomyopathies. Approximate mortality rates are <2% in-hospital, 10-15% at 6 months after diagnosis and 25-30% at 2-4 years. Recovery of LV function occurs in one-third to one-half of the women and may carry on for almost 2 years after diagnosis. Subsequent pregnancies have been associated with a high likelihood of relapse due to residual impairment of the LV contractile reserve. There is insufficient data on neonatal outcome. Keywords: Cardiomyopathies, heart failure, pregnancy, ventricular dysfunction. Affiliation:Surgical Intensive Care Unit, Shaare Zedek Medical Centre affiliated with the Hebrew University, POB 3235, Jerusalem 91031, Israel. Keywords:Cardiomyopathies, heart failure, pregnancy, ventricular dysfunction. Abstract:Heart failure is a leading cause of long-term maternal morbidity and mortality in developed countries. The most common cause of maternal heart failure is cardiomyopathy. Peripartum Cardiomyopathy (PPCM) is a distinct idiopathic disease that is not triggered by the hemodynamic changes and myocardial overload associated with pregnancy. Diagnostic criteria include the development of heart failure in the time frame between the last months of pregnancy and the months following delivery, the absence of prior heart disease or other identifiable causes of heart failure and an echocardiography demonstrating LV ejection fraction<45% and/or fractional shortening. Diagnosis requires a high level of suspicion; signs of heart failure may be masked by the pregnancy itself and/or by associated diseases such as hypertension and preeclampsia. The hallmark of the disease is the typical reduction in LV function. The incidence of PPCM ranges between 1:100 to 1:3000 live births, and is particularly high among women of African descent. It remains unclear whether race is a modifier of the disease or a risk factor unto itself. Plausable causes for the disease include: exacerbation of pregnancyinduced myocardial injury caused by certain virus strains, genetic and/or environmental factors, circulating autoantibodies, and a flaw in the normal cardioprotective mechanisms of pregnancy allowing development of a vasculopathy triggered by abnormal peripartum hormonal changes. Treatment is comprised of standard heart failure therapy (restriction of salt and water intake, diuretics, angiotensinconverting enzyme (ACE) inhibitors, mineralocorticoid receptor antagonists, beta blockers and digoxin) and preventive anticoagulation if the ejection fraction ≤35%. Delivery should be planned and carried out by a multidiscipliniary team. Maternal health should always take precedence over fetal health. Failed therapy should prompt further workup (magnetic resonance imaging (MRI) of the heart and/or cardiac catheterization and endomyocardial biopsy) and consideration of less conventional treatment modalities (e.g. immune modulation, bromocriptine), resynchronization, mechanical support and even heart transplant. The prognosis of PPCM is associated with the severity of heart failure at presentation and the response to therapy and is generally better than that of other cardiomyopathies. Approximate mortality rates are <2% in-hospital, 10-15% at 6 months after diagnosis and 25-30% at 2-4 years. Recovery of LV function occurs in one-third to one-half of the women and may carry on for almost 2 years after diagnosis. Subsequent pregnancies have been associated with a high likelihood of relapse due to residual impairment of the LV contractile reserve. There is insufficient data on neonatal outcome.